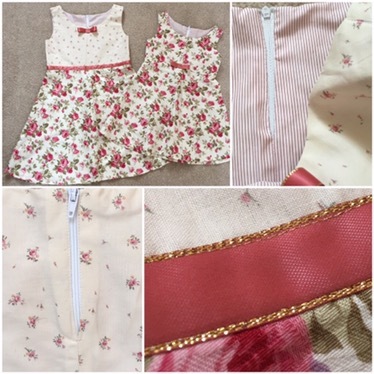 Sew the seam up to the zip mark on back & back-lining pieces. Sew the front to the front skirt & the back to the back skirt. Press the seams up toward the bodice. 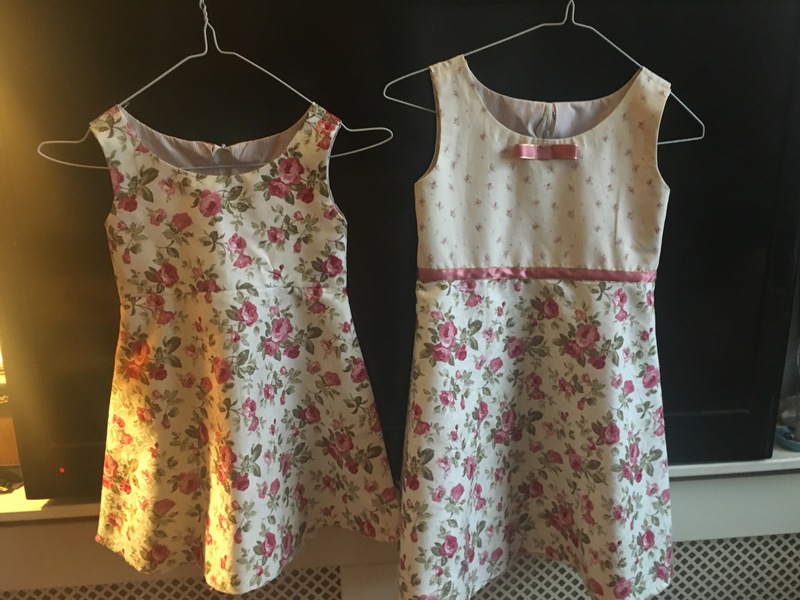 Sew, right-sides-together along the neckline and from armpits to shoulders. Clip, turn & press. 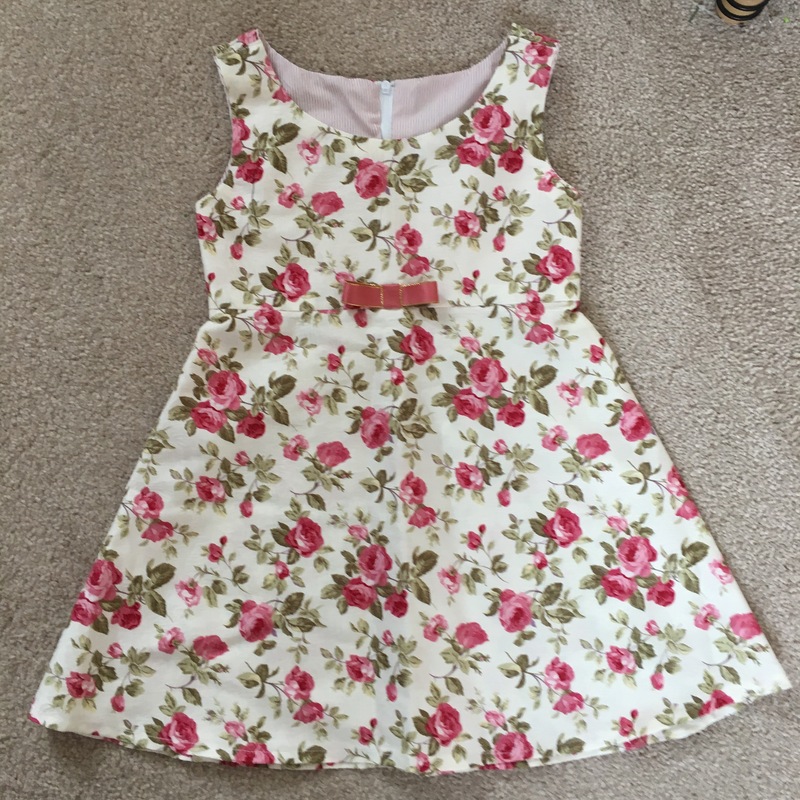 Sew the bodice back & back-lining together, without turning the shoulder seams, but narrowing by a few mm to make it slightly smaller within the seam allowance. Clip, turn & press. Fold the seam allowance of the linings to cover the stitching, press & stitch in the ditch from the right side, catching the lining underneath. Poke the back shoulder into the front shoulder & edgestitch down through all layers. French seam the sides, sew 1st: wrong-sides-together at 5mm, turn & press. Sew again at 10mm. I had some pink ribbon with gold edges (MrA collects (among (many) other things) ribbons), so I put my metallic thread up top & stitched some around the waist of the bigger dress. I also made a little bow to jazz up the front. I hemmed them the following night after work, before getting on the train & I hand sewed the linings to the zip before going to bed at the In-Laws’ in Bristol. Phew. The girls & the In-Laws loved them. They fit & looked lovely. I was later told discreetly there was a bit of a wriggle getting out of them, so I’m pretty sure if I make this pattern again I’ll extend the zip by putting it up the side seam (thanks for the tip Lainey, sounds like much more fun than adding a seam up the back 👍). 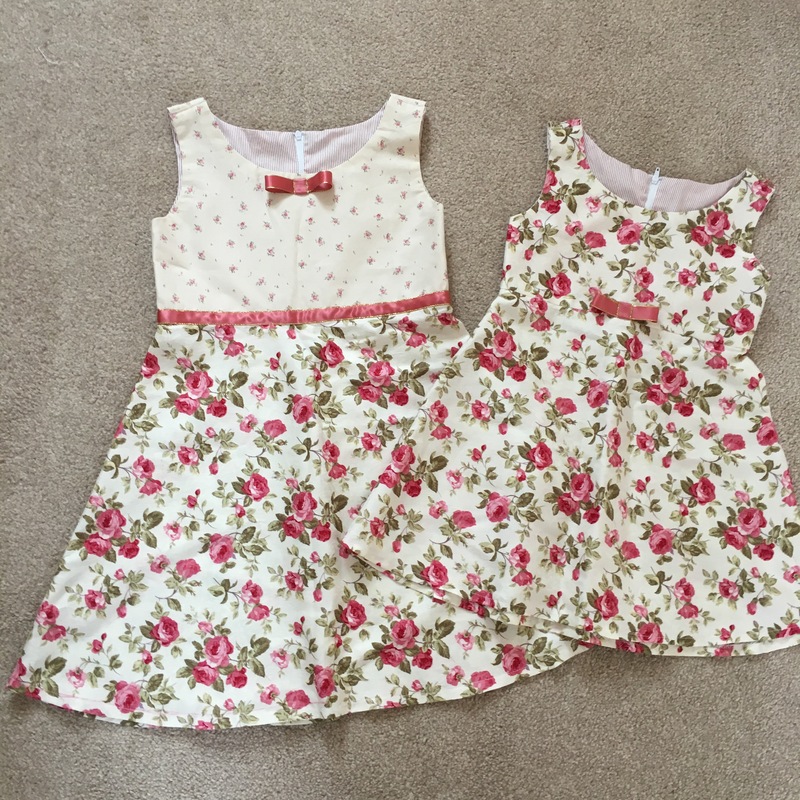 Now, where did that lovely fabric come from…? Pink embroidered- short boxy ladies jacket? Pink checks- PJ’s for MrA. Beige drill- ‘chinos’ for me. Navy cotton with white flower- shirts. Red checks- shirt for dad? Fine red/ white stripe shirting. Blue chambray with white stars- possibly shorts? 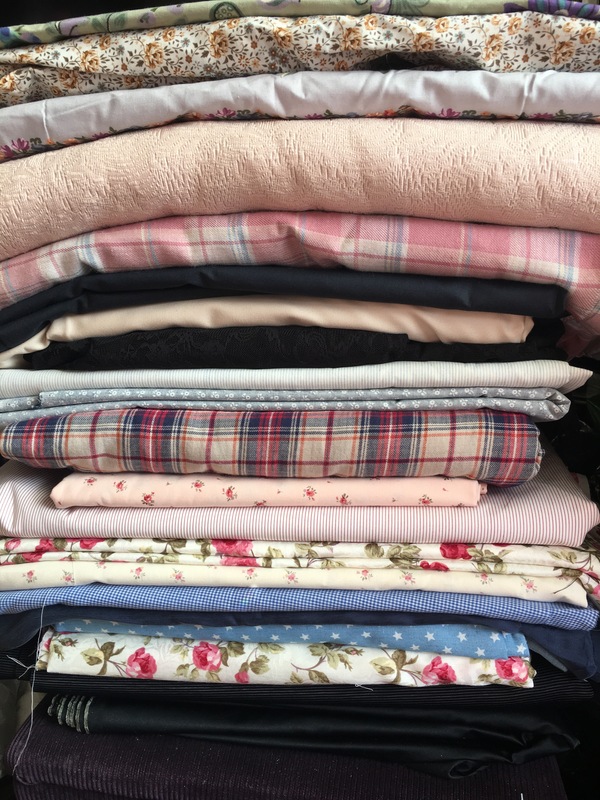 …So I’ve got some sewing to do… I’ve no idea how much will get made before the next distraction comes along, but I’m going to have fun finding out. Adapt pattern for side zip. Previous Previous post: Mint Choc Chip…? These are so cute!!! 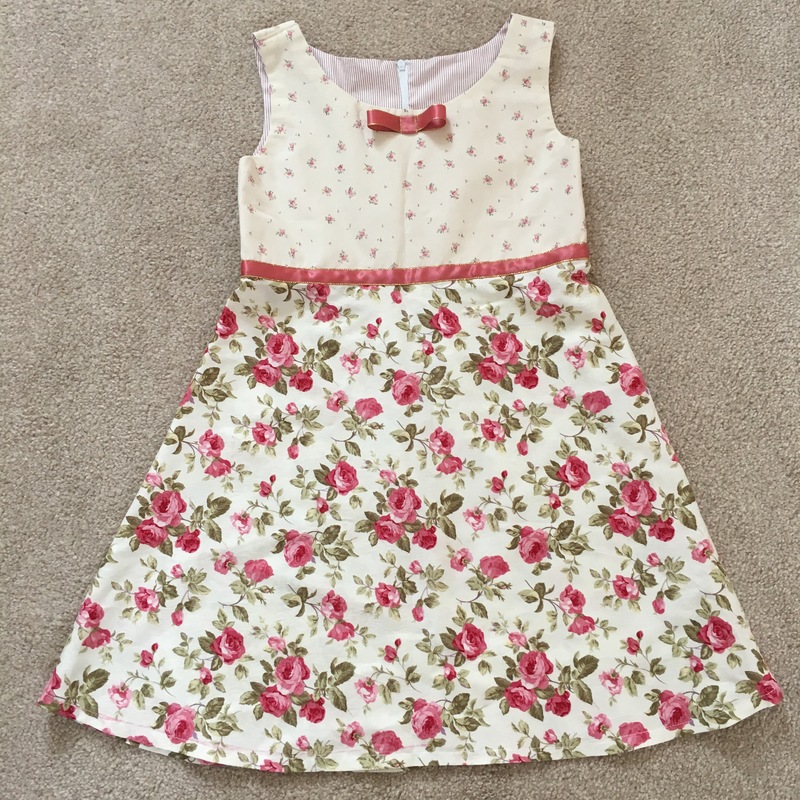 Makes me wish I knew little girls to sew for!